The story begins with a series of seemingly unconnected events, all over the globe. In Uzbekistan, an Ex-KCG officer is tortured murdered. In Cape Town, a group of international business tycoons discuss a rumor that the dead KCB officer had a nuclear suitcase Bomb hidden away. In Moscow, an Indian secret agent is exposed. The agent is shot dead while trying to send a code red message to India. In India, the head of RAW sees the incomplete message. All it contains is a number 242.Enter AGENT VINOD. Vinod (Saif Ali Khan) is the kind of agent who first kicks the door open and then finds out what's behind it. His unconventional approach puts him in dangerous situations, but he manages to get the crucial leads. Vinod is sent to Moscow to investigate why his colleague killed. Vinod finds out that a Russian money launderer Abu Nazar has sent 58 Million Dollars to a contact in Morocco, for an operation against India. Vinod leaves for Morocco, where he meets an elderly Mafidsi Kazan and the beautiful but mysterious or ruby. A series of twists and turns take Vinod across the globe from marakkesh to Riga, Karachi to Delhi and finally London. Where he discovers the ultimate conspiracy. Agent Vinod, you may not agree with his methods, but you sure are glade he's on our side. Agent Vinod your passport to action adventure. 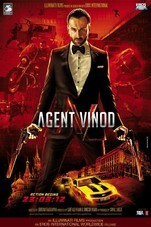 AGENT VINOD is uber-cool, vastly stylized and has been filmed at panoramic locales across the globe. Also, it's a well packaged secret agent movie. AGENT VINOD is a hi-octane espionage thriller with a heart. It is not just brawny and dynamic, but witty and crazy too. Ultra slick and stylish, this desi Bond movie adheres to the formula and succeeds in meeting the humungous expectations. AGENT VINOD has all the potential to develop into a triumphant franchise! This tale traverses 12 countries and follows decidedly hard-core spy, Agent Vinod (played by a believably tough and unquestionably cool Saif Ali Khan), as he tries to solve the murder of his friend. The character drives the whole film, he's got that touch of Bond humour that makes a good action film great, and it's the closest we've seen to a Big B-era 80s action this decade. Oh, and yes, the on-screen chemistry between real life couple Bebo and Saif is electrifying. This is - from beginning to end - a fun ride. What's Good: The action sequences; the stylized cinematography; the snappy editing. What's Bad: The ordinary story; the unnecessarily confusing script; the lack of an emotional connection between the audience and the protagonist; the absence of chemistry between Saif and Kareena's characters; the laughable climax. Verdict: Agent Vinod is a bold experiment gone wrong; certainly not something that entertains in its entirety. Watch or Not? : Watch it only if you want to see an Indian spy movie. But be warned that it comes nowhere closer to the Bond or the Bourne series of Hollywood films. If only Agent Vinod were a video game. It has all the hallmarks of a classic So yes, as a game it'd be sensational, and tremendous fun. As a film, on the other hand, Agent Vinod must be termed a disappointment, a slick and well-produced throwback to the spy thriller that feels both overlong and under-conceived. Agent Vinod wants to be funny, and while there is the occasional burst of wit, it's exhaustingly rare. Agent Vinod may be the best looking actioner we've seen, and Sriram Raghavan may be a unanimous choice to hold the joystick, but watching him play this particular game shows him distracted by the window dressing -- and not trying hard enough to save the princess.